"Hague" and "Den Haag" redirect here. For other uses, see Hague (disambiguation) and Den Haag (disambiguation). listen)) is the capital city of the province of South Holland in the Netherlands. With a population of 500,000 inhabitants (as of 1 September 2011), and more than one million inhabitants including the suburbs, it is the third largest city of the Netherlands, after Amsterdam and Rotterdam. Located in the west of the Netherlands, The Hague is in the centre of the Haaglanden conurbation and lies at the southwest corner of the larger Randstad conurbation. The Hague is the seat of the Dutch government and parliament, the Supreme Court, and the Council of State, but the city is not the capital of the Netherlands which constitutionally is Amsterdam. Queen Beatrix of the Netherlands lives at Huis ten Bosch and works at Noordeinde Palace in The Hague. Most foreign embassies in the Netherlands and 150 international organisations are located in the city, including the International Court of Justice and the International Criminal Court, which makes The Hague one of the major cities hosting the United Nations, along with New York, Vienna and Geneva. The Hague originated around 1230, when Floris IV, Count of Holland purchased land alongside a pond (now the Hofvijver) in order to build a hunting residence. In 1248 William II, Count of Holland and Rex Romanorum, decided to extend the residence to a palace. He died in 1256 before this palace was completed, but parts of it were finished by his son Floris V, of which the Ridderzaal (Knights' Hall), still extant, is the most prominent. It is still used for political events, such as the annual speech from the throne by the monarch. From the 13th century on the counts of Holland used The Hague as their administrative centre and residence when in Holland. The Hague is first mentioned as Die Hage in a document dating from 1242. In the fifteenth century, the smarter des Graven hage came into use, literally "the count's wood", with connotations like "the count's hedge, private enclosure or hunting grounds". Gravenhage was officially used for the city from the 17th century on. Today this name is only used in some official documents like birth and marriage certificates. The city itself uses "Den Haag" in all its communication. When the Dukes of Burgundy gained control over the counties of Holland and Zeeland at the beginning of the 15th century, they appointed a stadtholder to rule in their stead with the States of Holland as an advisory council. Their seat was located in The Hague. At the beginning of the Eighty Years' War, the absence of city walls proved disastrous, as it allowed Spanish troops easily to occupy the town. In 1575 the States of Holland even considered demolishing the city, but this proposal was abandoned, after mediation by William of Orange. From 1588 The Hague also became the location of the government of the Dutch Republic. In order for the administration to maintain control over city matters, The Hague never received official city status (although it did have many of the privileges normally granted only to cities). However, since the days of King Louis Napoleon (1806) The Hague has been allowed to call itself a city. After the Napoleonic Wars, modern-day Belgium and the Netherlands were combined in the United Kingdom of the Netherlands to form a buffer against France. As a compromise, Brussels and The Hague alternated as capital every two years, with the government remaining in The Hague. After the separation of Belgium in 1830, Amsterdam remained the capital of the Netherlands, while the government was situated in The Hague. Since early times, probably as far back as the 16th century, the stork has been the symbol of The Hague. Because of its history, the historical inner city of The Hague differs in various respects from the nearby smaller cities of Leiden and Delft. It does not have a cramped inner city, bordered by canals and walls. Instead it has some small streets in the town centre that may be dated from the late Middle Ages, and several spacious streets boasting large and luxurious 18th century residences built for diplomats and affluent Dutch families. It has a large church dating from the 15th century, an impressive City Hall (built as such) from the 16th century, several large 17th-century palaces, a 17th-century Protestant church built in what was then a modern style, and many important 18th-century buildings. When the government started to play a more prominent role in Dutch society after 1850, The Hague quickly expanded. Many streets were specifically built for the large number of civil servants employed in the country's government and for the Dutchmen who were retiring from the administration and exploitation of the Netherlands East Indies. The growing city annexed the rural municipality of Loosduinen partly in 1903 and completely in 1923. Parts of the city sustained heavy damage during World War II. The Atlantic Wall was built through part of the city, causing a large quarter to be torn down by the Nazi occupants. On 3 March 1945, the Royal Air Force mistakenly bombed the Bezuidenhout quarter. The target was an installation of V-2 rockets in a nearby park. Because of navigational errors, the bombs fell on a heavily populated and historic part of the city. 511 people died and the scars in the city may still be seen today. After the war The Hague was at one point the largest building site in Europe. The city expanded massively to the southwest. The destroyed areas were also quickly rebuilt. The population peaked at 600,000 inhabitants around 1965. In the 1970s and 1980s many, mostly white, middle-class families moved to neighbouring towns like Voorburg, Leidschendam, Rijswijk and, most of all, Zoetermeer. This led to the traditional pattern of an impoverished inner city and more prosperous suburbs. Attempts to include parts of these municipalities in the city of The Hague were highly controversial. In the 1990s, with the consent of Dutch Parliament, The Hague annexed fairly large areas from neighbouring towns as well as from not even bordering ones, on which complete new residential areas were built and are still being built. City life concentrates around the Hofvijver and the Binnenhof, where the Parliament is located. The city has a limited student culture due to its lack of an actual university, although the Royal Conservatory of The Hague and The Royal Academy of Art is located there, as well as The Hague University, a vocational university and a branch of The Open University of the Netherlands. The city has many civil servants and diplomats. In fact, the number and variety of foreign residents (especially the expatriates) makes the city quite culturally diverse, with many foreign pubs, shops and cultural events. 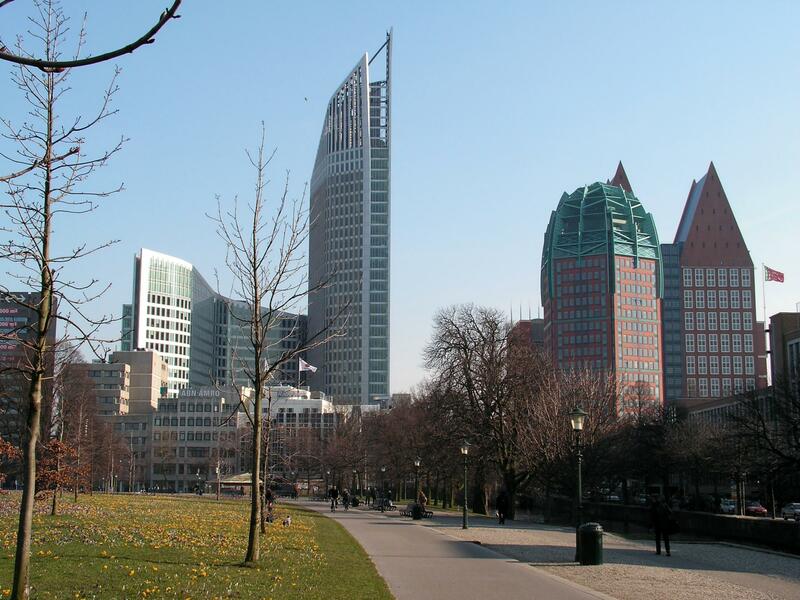 The Hague is the largest Dutch city on the North Sea and includes two distinct beach resorts. The main beach resort Scheveningen, in the northwestern part of the city, is a popular destination for tourists as well as for inhabitants. With 10 million visitors a year, it is the most popular beach town in the Benelux area. Kijkduin, in the southwest, is The Hague's other beach resort. It is significantly smaller and attracts mainly local residents. The former Dutch colony of Netherlands East Indies ("Nederlands-Indië", now Indonesia) has left its mark on The Hague. Since the 19th century high level civil servants from the Dutch East Indies often spent long term leave and vacation in The Hague. Many streets are named after places in the Netherlands East Indies (as well as other former Dutch colonies such as Suriname) and there is a sizable "Indo" (i.e. mixed Dutch-Indonesian) community. Since the loss of these Dutch possessions in December 1949, "Indo people" also known as "Indische people" often refer to The Hague as "the Widow of the Indies". The older parts of the town have many characteristically wide and long streets. Houses are generally low-rise (often not more than three floors). A large part of the southwestern city was planned by the progressive Dutch architect H.P. Berlage about 1910. This 'Plan Berlage' decided the spacious and homely streets for several decades. In World War II a large part of western The Hague was destroyed by the Germans. Afterwards, modernist architect W.M. Dudok planned its renewal, putting apartment blocks for the middle class in open, park-like settings. The layout of the city is more spacious than other Dutch cities, and because of the incorporation of large and old nobility estates, the creation of various parks and the use of green zones around natural streams, it is a much more green city than any other in the Netherlands. That is, excepting some medieval close-knitted streets in the centre. There are only a few canals in The Hague, as most of these were drained in the late 19th century. Some of the most prosperous and some of the poorest neighbourhoods of the Netherlands can be found in The Hague. The wealthier areas (Statenkwartier, Belgisch Park, Marlot, Benoordenhout and Archipelbuurt) are generally located in the northwest part of the city; however, the Vogelwijk and several very recently built quarters like Vroondaal are in the southwest, not far from the sea. Poorer areas like Transvaal, Moerwijk, and the Schilderswijk can be found in the southeastern areas. This division is reflected in the local accent: The more affluent citizens are usually called "Hagenaars" and speak so-called "bekakt Haags" ("Bekakt" is Dutch for "posh" or "stuck-up"). This contrasts with the "Hagenezen", who speak "plat Haags" ("plat" meaning "common" or "vulgar"). The tallest building is the 142-metre-tall Hoftoren (see image). The Hague has eight official districts (stadsdelen). They are divided into smaller parts (wijken). See Districts of The Hague for a detailed breakdown. The population of The Hague on 1 September 2011 was 500,000 inhabitants and are with that the third city of the Netherlands. The proportion of immigrants in The Hague 49% and ethnic Dutch 51%. On 1 January 2011 The Hague 241,000 immigrants counted: 73,000 of Western origin and 168,000 with Other non-western. The city contributes substantially to international politics: The Hague is home to over 150 international organisations. These include the International Court of Justice (ICJ), the International Criminal Court (ICC), the International Criminal Tribunal for the former Yugoslavia (ICTY), and the Appeals Chamber of the International Criminal Tribunal for Rwanda (ICTR). The foundation of The Hague as an "international city of peace and justice" was laid in 1899, when the world's first Peace Conference took place in The Hague on Tobias Asser's initiative, followed by a second in 1907. A direct result of these meetings was the establishment of the world's first organisation for the settlement of international disputes: the Permanent Court of Arbitration (PCA). Shortly thereafter the Scottish-American millionaire Andrew Carnegie made the necessary funds available to build the Peace Palace ("Vredespaleis") to house the PCA. After the establishment of the League of Nations, The Hague became the seat of the Permanent Court of International Justice, which was replaced by the UN's International Court of Justice after the Second World War. The establishment of the Iran-US Claims Tribunal (1981), the International Criminal Tribunal for the former Yugoslavia (1993) and the International Criminal Court (2002) in the city further consolidated the role of The Hague as a center for international legal arbitration. Most recently, on 1 March 2009, a U.N. tribunal to investigate and prosecute suspects in the 2005 assassination of Lebanese Prime Minister Rafik Hariri opened in the former headquarters of the Netherlands General Intelligence Agency in Leidschendam, a town within the greater The Hague area. The Hague is the fourth major centre for the UN, after New York, Geneva and Vienna. In line with the city's history as an important convention center and the current presence of institutions such as the ICJ, The Hague's city council employs a city branding strategy that aims to establish The Hague as the Legal Capital of the World and the International City of Peace and Justice. T-Mobile, a mobile network operator, part of Deutsche Telekom. PostNL a mail, parcel and e-commerce corporation with operations in the Netherlands, Germany, Italy, and the United Kingdom. There has never been any large-scale industrial activity in The Hague, with the possible exception of the fishing harbour in Scheveningen. Many of the city’s logistical and minor-industrial services are located in the Binckhorst (Laak district), which contains many large warehouses. Madurodam is a miniature city, containing hundreds of scale-models of Dutch landmarks in a typically Dutch miniature landscape. The Mauritshuis exhibits many paintings by Dutch masters, such as Johannes Vermeer, Rembrandt van Rijn and Paulus Potter. The Escher Museum ('Escher in the Palace') is located in the former Royal Palace on the Lange Voorhout. The Haags Historisch museum showcases the history of the city from the Middle Ages to the present day. The Museum Bredius houses part of the collection of 19th century art historian Abraham Bredius, containing antique furniture, silverware and porcelain. Museum Gevangenpoort (lit. the "Prison Gate") is a former prison housed in a 15th century gatehouse, with genuine mediaeval dungeons and torture chambers. The Gemeentemuseum (Municipal museum) is home to the world’s largest collection of works by the Dutch painter Piet Mondriaan as well as other modern art. The Museon is an interactive and historical science museum. The Omniversum is Europe’s first 360° IMAX-cinema. Panorama Mesdag houses a cylindrical 360° "panoramic" painting, 14 meters high by 120 meters long, depicting the sea-front at Scheveningen in the late 19th century, made by Hendrik Willem Mesdag. It is presented in such a way that it is almost as if one is looking at a real scene rather than a painting. The Museum voor Communicatie (formerly the "PTT Museum") is the national postal museum and houses interactive exhibits as well as one of the country’s best collections of stamps. The Louis Couperus Museum is devoted to the life and works of Louis Couperus (1863–1923). The museum Beelden aan Zee in Scheveningen has a large collection of sculptures, mainly from the 20th century artists. The Koninklijke Schouwburg ("Royal Theatre"), located on the Korte Voorhout, is the home of the "Nationaal Toneel" ("National theatre-group"). The Lucent Danstheater is home to the internationally celebrated Nederlands Dans Theatre, a modern dance company. The building was designed by the Dutch architect Rem Koolhaas in 1988. It shares a lobby with the Anton Philipszaal, home of the Residentie Orkest, the city's most important symphony orchestra. New European Ensemble is an ensemble for contemporary music consisting on international musicians. The ensemble has it's main base in the city. Paard van Troje is located in The Hague and is one of the 10 biggest music venues in the Netherlands focused on popular music. Muziekcafé de Paap is located in The Hague and famous for its livemusic. Some of the biggest Dutch artist are discovered here. The historic Binnenhof ("Inner Court") and Medieval Ridderzaal ("Knights' Hall"), which now contains the Houses of Parliament and government offices. A good view can be obtained from the leafy Lange Vijverberg on the other side of the adjacent lake called the "Hofvijver" (lit. "Court Pond"). The Lange Voorhout is a wide avenue containing many splendid houses (now home to several embassies) as well as The Hague's oldest and narrowest house and the famous "Hotel des Indes", the city’s most luxurious hotel. "De Passage" (pronounced as in French) was the Netherlands' first covered shopping mall. Dating from the late 19th century, it contains many expensive and speciality shops. The "Paleis Noordeinde" has been Queen Beatrix' official work-palace since 1984. It is closed to the public, but the Palace Gardens ("Paleistuin") are accessible to the public. The Clingendael Park is an old landed estate with a Japanese Garden. Nearby one can also find the home of the Clingendael Institute of International Relations. Queen Beatrix' residential Palace, "Paleis Huis ten Bosch", can be found a little outside the city centre in the "Haagse Bosch" forest. The Hague does not have the customary metropolitan reputation for a bustling night life, with some festivity exceptions in the course of the year. This is partly explained by the city's lack of a university and hence student life. Night life centers around the three main squares in the city center: the Plein (literally "Square"), the Grote Markt (literally "Great Market") and the Buitenhof (literally the "Outer Court", which lies just outside the Binnenhof). The Plein is taken by several large sidewalk cafés where often politicians may be spotted. The Grote Markt is completely strewn with chairs and tables, summer or winter. The Buitenhof contains the popular Pathé Buitenhof cinema and a handful of bars and restaurants in the immediate vicinity. A similar pattern of night life centers on the cinema in Scheveningen, although, especially in summer, night life concentrates around the sea-front boulevard with its bars, restaurants and gambling halls. The city's major football club is ADO Den Haag. They play in the Eredivisie (the top division in the Netherlands). They are two time winners of the KNVB Cup and won the League twice in the era before professional football. They play their matches at the 15,000 seat Kyocera Stadion. There is an amateur football club HVV Den Haag. HVV was the most successful Dutch football club prior to World War I. The handball team is HV Hellas Den Haag, active in the top division. January: The Hague International Model United Nations (THIMUN) is a five day conference held at the World Forum, gathering over 4000 students from over 200 secondary schools across the globe. It is the oldest and largest high school United Nations simulation in the world. 29 April: "KoninginneNach" ("Queen's Night", pronounced with a "plat Haags" accent) is held the night before "Koninginnedag"; there are several open air concerts in the city and young people flock from all over the country to drink and party. It is the largest open air festival in Europe. 30 April: "Koninginnedag" ("Queen's Day") is a Dutch national holiday held on the birthday of former Queen Juliana. On this day the colour orange predominates at a funfair (which sells orange cotton candy) and scores of informal street markets. The day is a "vrijmarkt" (literally "free market"), which means no licence is needed for street vending; children traditionally use this day to sell old unwanted toys. May & June: The Tong Tong Fair is one of the largest Eurasian cultural festivals in Europe. It focuses on Indo culture. June–September: Den Haag Sculptuur is an open air exhibition of sculptures. The 10th edition, in 2007, celebrated the 400 years of the relationship between the Netherlands and Australia. June: The Hague Jazz festival. June: Vlaggetjesdag in Scheveningen is a festival celebrating the arrival of the first new herring of the year. The last Sunday in June: Parkpop is the largest free open air pop concert in Europe. July: Jazz in de Gracht is an intercultural two-day event hosting Jazz groups which perform their music on flat-bottom boats and in bars in various places between Passantenhaven and Zuidwal. July & August: The city hosts a series of weekly firework displays by the sea front in Scheveningen, as part of an international fireworks festival and competition. July & August is the annual Summer School of The Hague, an international summer course for young dancers, initiated by Mirella Simoncini with guestteachers from Het Nationale Ballet, Nederlands Dans Theater, Cullberg Ballet, Royal Conservatory of The Hague, Codarts and choreograohy workshops with repertoire from Itzik Galili, Mats Ek, Marius Petipa a.o. July: "Milan", Europe’s biggest Hindustani open air event held in Zuiderpark. The third Tuesday in September: "Prinsjesdag" (literally "Prince's Day") is the Dutch State Opening of Parliament when the Queen reads the "speech from the throne" ("Troonrede"). The day is popular among monarchists and tourists who are out to see Queen Beatrix and the royal family in the Golden State Coach ("de Gouden Koets"). There are two main train stations in The Hague: Den Haag Hollands Spoor (HS) and Den Haag Centraal Station (CS), only 1.5 km distant from each other. Because these two stations were built and exploited by two different railway companies in the 19th century, east-west lines terminate at Centraal Station, whereas north-south lines run through Hollands Spoor. The international Benelux trains to Brussels call only at Hollands Spoor. Centraal Station does, however, now offer good connections with the rest of the country, with direct services to most major cities, for instance Amsterdam, Rotterdam and Utrecht. Public transport in The Hague consists of a tramway network and a sizeable number of bus routes, operated by HTM Personenvervoer. Plans for a subway were shelved in the early 1970s. However, in 2004 a tunnel was built under the city centre with two underground tram stations ("Spui" and "Grote Markt"); it is shared by RandstadRail lines 2, 3 and 4 and tram route 6. RandstadRail connects The Hague to nearby cities, Zoetermeer, Rotterdam and Leidschendam-Voorburg. It consists of three light rail lines (2, 3 and 4 to Zoetermeer and Leidschendam-Voorburg) and one subway line (E to Rotterdam). Major motorways connecting to The Hague include the A12, running to Utrecht and the German border. The A12 runs directly into the heart of the city in a cutting. Built in the 1970s, this section of motorway (the "Utrechtsebaan") is now heavily overburdened. Plans were made in the late 1990s for a second artery road into the city (the "Trekvliettracé" or previously called "Rotterdamsebaan") but have continually been put on hold. Other connecting motorways are the A4, which connects the city with Amsterdam, and the A13, which runs to Rotterdam and connects to motorways towards the Belgian border. There is also the A44 that connects the city to Leiden, Haarlem and Amsterdam. The Hague is the centre of a conurbation called Haaglanden. The Leiden conurbation lies to the north. The Rotterdam conurbation (called "Stadsregio Rotterdam" or "Rijnmond") lies to the east. The conurbations around The Hague and Rotterdam are close enough to be a single conurbation in some contexts. For example, they share the Rotterdam The Hague Airport and a light rail system called RandstadRail. Consideration is being given to creating a Rotterdam-The Hague metropolitan area (metropoolregio). This large conurbation centred on The Hague and Rotterdam is, in turn, part of the Randstad, specifically a band of municipalities called the South Wing (Zuidvleugel). The Randstad, which includes Amsterdam, Rotterdam and Utrecht, has a population of 6,659,300. The Hague lies at the southwestern corner of one of the largest urban areas in Europe. In addition, The Hague has a policy to partner with various countries of origin of its citizens. Since 2002 The Hague co-operates with Suriname and in 2009 a co-operation contract was made with the Moroccan provinces of Nador, Al Hoceima and Taza. There are plans to make such contracts with Turkey and the Antilles. ^ "Baby Chris is 500,000th resident of The Hague". www.denhaag.nl. 1 September 2011. http://www.denhaag.nl/en/residents/news-and-events/to/Baby-Chris-is-500000th-resident-of-The-Hague.htm. Retrieved 1 September 2011. ^ "Den Haag verwelkomt halfmiljoenste inwoner". www.denhaag.nl. http://www.denhaag.nl/home/bewoners/to/Den-Haag-verwelkomt-halfmiljoenste-inwoner.htm. Retrieved 1 September 2011. ^ (Dutch) http://taaladvies.net/taal/advies/vraag/1199/ Explanation from Dutch language centre. ^ (Dutch) http://www.denhaag.nl/home/bewoners/to/Haagse-weetjes.htm Why does The Hague have a stork for asymbol? ^ "Stadsdelen" (in Dutch). www.denhaag.nl. 25 augustus 2009 (last update 18 oktober 2010). http://www.denhaag.nl/home/bewoners/stadsdelen-en-wijken/to/Stadsdelen-9.htm. Retrieved 31 August 2011. ^ "Niet-westerse allochtonen per gemeente 2010-2040" (in Dutch). Rijksinstituut voor Volksgezondheid en Milieu, Ministerie van Volksgezondheid, Welzijn en Sport. http://www.zorgatlas.nl/beinvloedende-factoren/demografie/etniciteit/niet-westerse-allochtonen-per-gemeente-2010-2040/. Retrieved 31 August 2011. ^ Slager, Seije (11/03/09). "Beveiliging is routine voor Haagse autoriteiten" (in Dutch). Trouw. http://www.trouw.nl/tr/nl/4324/Nieuws/article/detail/1132183/2009/03/11/Beveiliging-is-routine-voor-Haagse-autoriteiten.dhtml. Retrieved 31 August 2011. ^ "TheEuropeanLibrary.org". TheEuropeanLibrary.org. http://www.theeuropeanlibrary.org/portal/index.html. Retrieved 4 July 2010. ^ "Bethlehem Municipality". www.bethlehem-city.org. http://www.bethlehem-city.org/Twining.php. Retrieved 10 October 2009. ^ "Memo from municipality of The Hague" (PDF). http://zbs.denhaag.nl/risdoc/2009/RIS163029.PDF. Retrieved 13 April 2011. (English) City of The Hague. (English) The Hague Festivals 2011. HagueJusticePortal.net, The Hague Justice Portal: an academic gateway to The Hague organisations concerning international peace, justice and security. , Official site for Scheveningen beach). This page uses content from the English language Wikipedia. The original content was at The Hague. The list of authors can be seen in the page history. As with this Familypedia wiki, the content of Wikipedia is available under the Creative Commons License.